I unpacked the last box. I have a fully functioning kitchen. And blueberries are in season.I never knew how many varieties of blueberries there were until I started going to my local farmer’s market. Before, I would grab a box of blueberries, never even realizing what my tastebuds were missing. From the big, juicy, sweet berries to the small, plump, tangy ones, there are such a wide variety of blueberries available I couldn’t believe I had been in the dark for so long. And speaking of sugar, cheesecake is one of those things I could eat with a spoon. As in, pass me a spoon, and that cheesecake, and let me scoop out all the tasty insides. 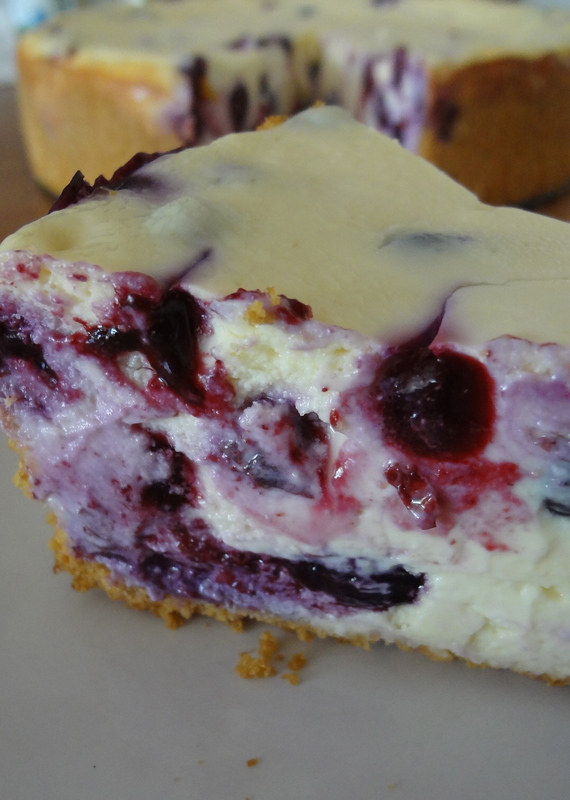 I used a mix of blueberry varieties with this creamy, perfect cheesecake recipe. The sweet and tangy complemented the sweet and tang of the cheesecake amazingly. I’m officially obsessed. 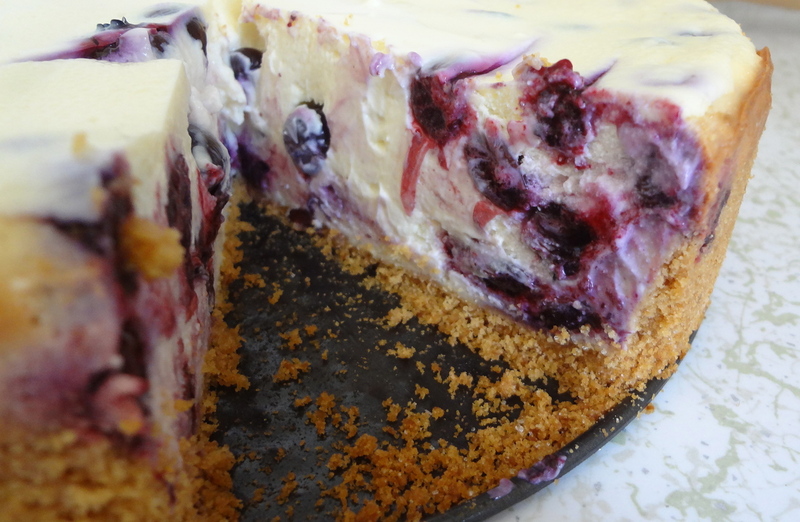 I would recommend this recipe to anyone looking for a great cheesecake, or a way to use up a bounty of blueberries. 1. Combine graham cracker crumbs, melted butter and sugar. Press into bottom and up sides of a 9 inch springform pan. Bake at 350 degrees for 5 minutes. Remove and let cool. 2. Beat softened cream cheese and add 1 cup sugar, flour and salt until blended. Add eggs, one at a time and blend. 3. Add greek yogurt, vanilla and lemon juice. Gently stir in blueberries. Pour mixture into cooled crust. 4. Bake at 325 degrees for approximately 50 minutes. (Cheesecake will be done when it still jiggles in the middle.) Turn off oven and let remain in oven with door open for 20 minutes. Remove and let cool. Cover and chill cheesecake in refrigerator. This entry was posted in Uncategorized and tagged Baking, Blueberries, blueberry cheesecake, Cheesecake, Desserts, summer desserts by theculinarycapers. Bookmark the permalink.